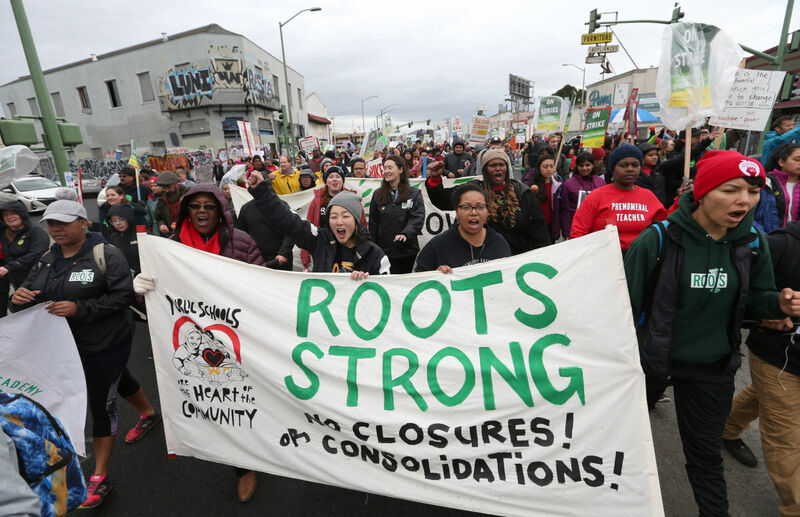 On the fourth day of their strike, teachers, students and supporters march down International Boulevard toward a rally at Roots International Academy in Oakland, California, on February 26, 2019. The recent teacher strikes in the U.S. were galvanized in large part by anger over things, such as low wages, overcrowded classrooms and public school closures. Other vital issues have been outside curriculum interference, abysmal working conditions, health care and uncertain pensions. Historically, teachers have been undervalued and underpaid, from the days of Socrates to medieval monks to one-room schoolteachers. Wealthy and powerful leaders of antiquity relegated educating sons (rarely daughters) to well-read, often brilliant slaves. In medieval Europe, Catholic “cathedral-school” teachers were monks and priests costing the Church only room and board. They trained clergy, as well as preparing elitists’ sons for high positions in statecraft and commerce. When the ruling class expanded education outside monasteries, they boarded tutors who, while brilliant and competent, still were regarded as house servants who could be fired on a whim. It’s been a timeless disrespectful attitude that has come home to roost in the current uprisings in the U.S. — and going global — calling for change in how teachers are treated. The latest attack on teachers comes from President Trump, whose 2020 budget proposal slashes $7.1 billion from public education and kills funding for the federally required teachers’ professional development program. In the U.S., decades of such treatment have finally led to the rise of a militant teachers’ movement we see today. The formal U.S. education system began in 1635 with church-run private schools and colleges, such as Boston Latin School and Harvard College. Teachers might have borne the title of “master,” but were still considered hired help — with comparable wages and job insecurity. At the time, the majority of colonial children were unschooled, busily providing essential free labor on farms and households, or earning 40-60 cents a week for 12- to 16-hour days as mill workers. After the Revolutionary War, cities were so flooded with impoverished and immigrant children that in 1805, wealthy New Yorkers and business leaders sought to clear the streets by offering free schooling for common children in an unheated abandoned building. The ulterior motive, of course, was training a future workforce: obedient, grateful, dependable, able to endure those 14-hour days — but never strike. Dozens, aged five to 15, flocked to the “New York Free School.” The school’s records don’t reveal teachers’ salaries, but they had to have been minuscule leftovers from its $6,501 startup fund. Such massive classes required adopting the famous teaching system of British educator Joseph Lancaster. The Lancastrian system was to become the bedrock teaching method for decades in thousands of U.S. one-room public schoolhouses. Lectures were passed from the oldest to the youngest under the classic educative credo of “He who teaches, learns.” Students chosen as monitors served as row-to-row “repeaters” of the lecture. Curricula covered reading, writing, arithmetic, “science and objects,” the Bible and morals. All subjects were taught by listening and rote-memory. The system also inspired hundreds of monitors to become teachers prior to formal training after 1832 in “normal schools,” which set normal standards for educators. For young women, teaching became one of the few occupations open for those unwilling to work in factories, stores, or to become bookkeepers or hired help. School attendance laws began in 1836, restricting children’s employment to three or four months each in summer and winter. When attendance requirements expanded to nine months and then added mandated attendance for those under 16, it set off a monumental spread of public schools supported by state taxes. For teachers in great demand, it should have meant higher pay, smaller classes, adequate teaching supplies and better working conditions, but it didn’t. Instead, city teachers faced class sizes of nearly 50. Those in one-room schools were expected to educate 40 first- to eighth-graders. Even before the Civil War decimated the classrooms of mostly male teachers, many had quit because the profession’s paltry pay proved insufficient to support a family. In Iowa in 1849, men outnumbered women in classrooms by 336 to 245, but by 1894, the ratio was 22,117 women to 5,726 men. Tight-fisted school boards knew single women were undemanding and willing to teach for half that of men’s wages. In Kansas, for instance, annual salaries in 1870 for women were $161.72, but $205.92 for men — a common inequality around the country. Yet the public’s belief was — and still is — that all children should be educated to read, write and calculate, at least to the eighth grade. That belief was demonstrated in rural areas by 212,000 one-room schoolhouses which served half of all U.S. children, according to Andrew Gulliford’s book, America’s Country Schools. Families boarded rural teachers — and monitored their behavior — sometimes grudgingly during hard times of poor harvests, or after the Bank Panic of 1857. By 1869, many could only pool less than $19 a month for salaries and construction materials for schools. Then came the teachers’ awakening: They realized they could improve their humble lot by banding together to demand higher salaries, smaller class sizes, better and safer working conditions, and even pensions — backed by threats of “collective absenteeism.” Further, they wanted to be ranked and respected like lawyers and doctors. Thus, they started a professional association, the National Education Association (NEA) in Philadelphia in 1857. Shocked and unnerved, public school officials around the U.S. feared the NEA masked a union which would soon be making demands. Unlike unions, however, when the NEA dared make demands, it was in a less confrontational manner. For the next six decades of “maybe-next-year,” militant teachers realized union successes — higher pay, shorter hours, safer work conditions and pensions — came from table-pounding and strike threats during collective bargaining. To the horror of the NEA’s leadership, hundreds of its members formed a “craft” union in April 1916, the American Federation of Teachers (AFT). Alliances with other unions and the national AFL-CIO earned the AFT far more benefits than just higher wages: members won tenure laws, improved pensions, academic freedom, school desegregation and the start of pay equity for women. But up to the 1950s, both the NEA and AFT had no-strike policies. Teachers taking spare time and paying tuition to upgrade knowledge and stay relevant for in-depth coverage of subject material has proved almost worthless ever since 1969. That’s when national standardized tests were required to measure student achievement in math, science and reading. Other major outside factors impacting performance in these tests were obvious, but are still ignored: social and economic inequality, regional differences, state expenditures for education, as well as health problems and test anxiety. Worse, President George W. Bush’s 2002 No Child Left Behind Act (NCLB) pitted test results against a teacher’s pay and job security — and prompted closures for failing schools. Small wonder most classroom time and energy soon was devoted to “teaching to the test” rather than covering and discussing subject material. A dozen years of teachers’ howls about that law finally forced Congress and President Barack Obama seemingly to countermand that punitive federal policy with the “Every Student Succeeds Act of 2015. It transferred federal control of public education back to state and local officials. Teachers desperately hoping it would reverse NCLB found that test scores were still a factor, but at least the law offered multiple remedies and funds to help failing schools. Other restrictive measures for teachers followed. One was the standardized Common Core curriculum, ordering subjects to be taught and ruling out regional deviations as well as new and topical courses. The latest tactic controlling teachers are canned lesson plans being pitched as “high-quality” education by the sponsoring Bill and Melinda Gates Foundation. To spread it nationally, the foundation is giving $1 million grants to 10 qualifying districts with more than 50,000 students. Corporate control of teachers and public schools is not new. Eighteen states already give “dollar-for-dollar” tax credits to individuals (10 percent maximum on gross income) or corporations (5 percent of taxable income) that donate to schools and expect influence on course material and teaching. Aside from adverse impact on public education, it’s lost state tax revenue. All these factors have delivered significant blows to providing in-depth knowledge of subjects for public school students. But the two greatest destroyers of their teachers and public schools themselves, as their enemies have long planned, could be the 1990 resurrection in Wisconsin of school-choice vouchers, and, in 1991, Minnesota’s starting charter schools. Vouchers are state-funded individual payments toward private-school tuition and now used in nearly 30 states. President Trump has tried vainly since 2017 to federalize them, allocating $1 billion in the fiscal year 2019 budget bill. So, he’s trying again with his proposed budget for fiscal year 2020. It stipulates that $5 billion of taxpayer money must be spent not just for vouchers, but “scholarships” given to private and parochial K-12 schools, and that $500 million in grants be given to charters. The idea is to starve public schools into privatization, paying remaining teachers as little as possible while offering only limited benefits. Last year, 60 percent of charter teachers reportedly earned between $32,500-$39,000, depending on the state and locale. By contrast, the range for public school teachers currently is the lowest in South Dakota at $42,266 and highest in Alaska at $72,445, on average. The latest nationwide count of charters lists 6,855 in the U.S., up from 1,993 in 2001. By January, charters were in 44 states and Washington, D.C. They operate by a state’s charter laws and receive the same K-12 per-pupil tax money from a state as public schools. But charters are not regulated, monitored or accountable to the state. Nor is teacher certification required. Many charters are also said to encourage a “high turnover rate of faculty to ‘keep things fresh.’” That kind of “culture,” of course, curtails wage hikes and benefits, and as a result, profits are valued over students as a first priority . To understand what happens with this split of state taxpayer dollars between public schools and charters, let’s consider a thought experiment. Say a school district has 4,000 children enrolled in K-12 public schools. If the state’s per-student allocation is $11,762 (the current U.S. average), the district will get $47,048,000 annually. But what if, as in Oakland, 30 percent (1,200) transfer to the district’s charter schools? They’ll take $14,114,400 with them. Public schools have other resources: property taxes, federal sums, grants and donations. But losing more than that “$14 million” from 1,200 students means huge budget cuts, too often starting with labor costs of teachers and staff. Then, those half-empty classrooms soon lead to school closures and layoffs. That leads to another crisis, because having to transfer students to pack another public school adversely and directly impacts its teachers and educational function. The state of Illinois permitting charters to expand in Chicago led to such overcrowding in remaining schools that some teachers were forced to hold classes in adjacent trailers, in “hallways, closets and even staircases.” One kindergarten class had 51 children. That happened because Chicago’s school board was forced to close 50 schools in 2013. Oakland will have closed 39 of its 101 schools. The scene is the same around the country. Between 2014 and 2015, 1,573 public schools closed, involving transfers of 212,000 students. Ironically, some 2,500 charters also closed between 2000 and 2013, often with little or no notice to students and teachers. Three just closed in Arizona, with 100 more expected out of its 544 charters. A Nashville, Tennessee, charter also just shut down, giving students two-days warning to find another school. Local, state and federal investigations found “financial irregularities,” noncompliance with federal disabilities law, and violations of fire codes (20 students in a room for eight). It was a repeat of last year’s sudden closure of one of the nation’s largest online charters, which stranded 12,000 students, including graduating seniors. Based in Ohio, the state successfully sued to recover nearly $80 million from inflated enrollments between 2015 and 2017. Whether it’s an overnight or mid-year closure, charter students have to find another charter, or return to public schools. Or they must apply for federal vouchers to meet high-priced tuition bills at private schools — if they are accepted. As for charter teachers, it’s a return to the days of frantic job searches. Charters usually fold because of indebtedness or other fiscal problems, particularly when owners hire for-profit school management firms and chains. Sometimes it’s fraud for inflated enrollment to get additional taxpayer dollars. More often, it’s either having to share state monies with other district charters or renting quarters from for-profit school properties at inflated rates. For instance, a Cleveland charter reportedly paid some $500,000 above local rates. That raises the central question of whether states should continue funding charters. Think what retrieving that imaginary $14,114,400 from charters would do for public school funding, especially for teachers’ salaries. Teachers on picket lines or packing legislature rotundas and offices have recognized for years that charters have robbed them of adequate salaries and benefits, as well as playing a major role in destroying public schools. Like those Texans rallying at their capitol in mid-March, they’re demanding states either stop funding charters or end their expansion. They’re in the front lines of preserving every American K-12 student’s right to a free public education. Educators need the public’s help in stemming the privatizing trend steamrolled by those long opposed to spending a nickel of tax money on public education. That includes Trump and allies like Department of Education Secretary Betsy DeVos, billionaires like the Koch brothers and the Gateses, the charter industry, and longtime enemies of public schools in Congress and state and local governments. Such help could come from the thousands of students who’ve been on the teachers’ picket lines and chalking sidewalks with supportive slogans. Or students could sue states for permitting charters to deny their constitutional rights to life, liberty and property gained by education. That’s been the route youths have taken to protect the environment in a U.S. Supreme Court case. Students certainly would have standing and mountains of evidence about the significant damage charters’ have done to destroy their future. Parents could file such a lawsuit on the grounds that charters may call themselves “public charter schools,” but fail to operate like public schools in everything from state regulations to accountability. In addition, public school supporters could draft a legislative bill or a petitioned initiative along those same lines — and lobby it in their neighborhoods and legislative representatives. To do less is a victory for elitists who throughout history have tried to make sure only the privileged receive an education. The burden is now on the general public to make sure that doesn’t happen, shown in the current, continuing pattern of Ivy League school admissions. As for Trump’s proposed $7.1 billion budgetary butchery of public schools and educators, it’s a given that when the nation’s striking teachers get demands met by districts, they, the NEA/AFT and both students and families will turn attention and energies toward lobbying Congress once again to “block his kick.” Last fall, despite the president’s demands for drastic cuts, Congress passed the largest increase — $581 million — in Education Department history for its $71.5 billion allocation. So, the teachers once again will be ready when the students appear. Teachers in Colorado, Virginia and Oakland are protesting, while teachers in red states face retaliatory legislation. Can the Nation’s First Charter School Strike Transform the Industry? Illinois state reps, in solidarity with Acero charter network strikers, announced bills to reform the charter industry.